The biggest script change from the previous version of The Song of the Nightingale and the upcoming Town Hall Theatre production is the removal of two clown-like twins named Long and Feng. This duo served as the Emperor's main attendants and provided a lot of the comic relief in the show. They did cartwheels, offered sarcastic commentary, and oh -- the puns! When it came time to revise the show, however, I knew that I needed to cut down the duration considerably. Long and Feng rarely did anything to push the plot forward, and anything that did feel substantial to the story could easily be handed to another character. I decided to try this new version without them. By doing so, I also discovered that removing the characters of Long and Feng allowed the humor and presence of the other characters to shine through more clearly, without any vaudevillian interruptions. What's remarkable is that the idea of cutting the twins from the show would never have dawned on me sans the prospect of a second production on the horizon. As I said in a previous post, I don't know that a show is ever "done," but I'm so grateful to Town Hall Theatre for this chance to explore and experiment with a more streamlined Nightingale. And thank you, Long and Feng, for your time and service to the show. 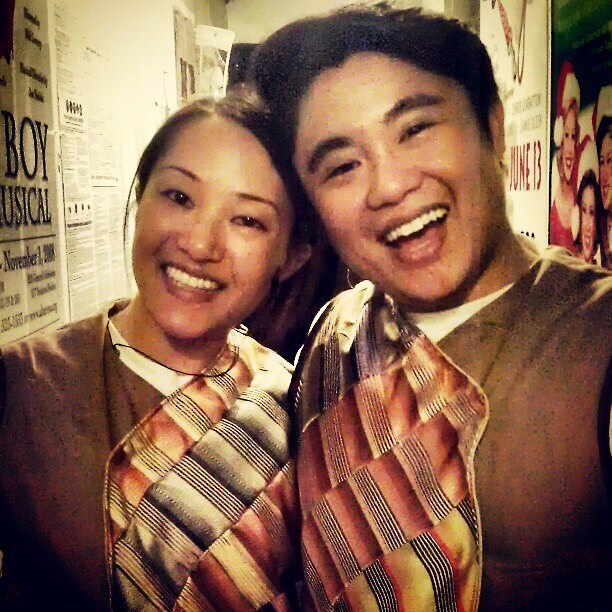 Feng (Isabel To) and Long (Christopher Juan) - you will be missed. But don't worry! Isabel and Chris are now playing other roles in the new production! Posted on September 20, 2017 by Min Kahng and filed under Adaptation, Creative, Musical Theater, Nightingale, Performing Arts, Writing and tagged The Song of the Nightingale Town Hall Theatre Isabel To Christopher Juan.